Silver Line Founder: Dame Esther Rantzen. Staff at the Dewsbury branch of Yorkshire Building Society are calling on older people not to suffer from loneliness in silence by promoting its partnership with The Silver Line. The charity, which was launched by Dame Esther Rantzen in 2013, operates the UK’s only free and confidential 24/7 helpline to tackle loneliness and isolation among older people aged 55 and over. Some of the Society’s colleagues form part of the network of Silver Line Friends across the UK who make weekly calls to older people who have contacted the charity asking for help. 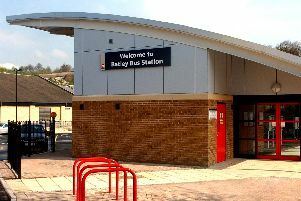 Nicholas Johnson, manager of the Dewsbury branch, said: “We’re proud to be working in partnership with The Silver Line to raise awareness of the issues faced by older people in our community, some of who feel very lonely and isolated. “The feedback we get from both colleagues who volunteer their time as Silver Line Friends and beneficiaries of the scheme is amazing. Call 08004 708090 to contact the Silver Line Helpline.